Yesterday at the Abassiya museum we asked Madame Fehri if she knew of any fishermen who would be willing to take us out on their boat. Our guide book said this was a common practice, and we were eager to learn more about local way of life. 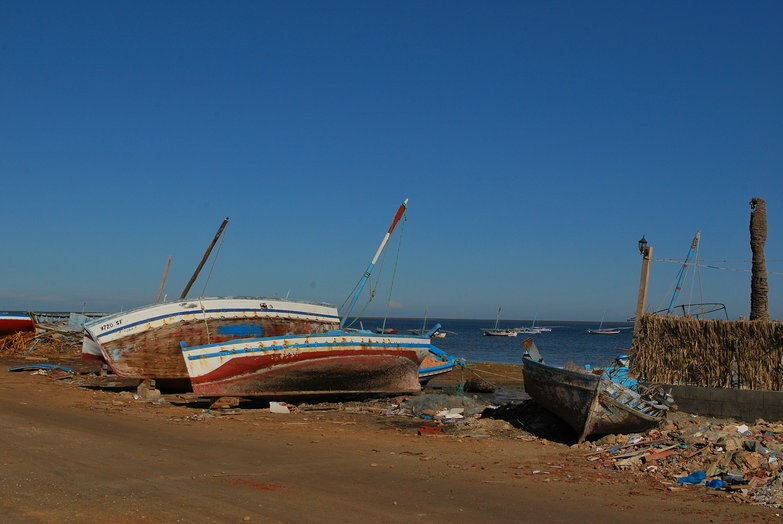 Fishing is the primary source of income for people on the island. Madame Fahri's said we should go see Sta Ali. When she failed to find his number in her cellphone, she wrote instructions on a piece of paper and then explained them: "Go to the village of El Attaya, she said, "and ask anyone for 'Sta Ali.' They will know him and show you the way. 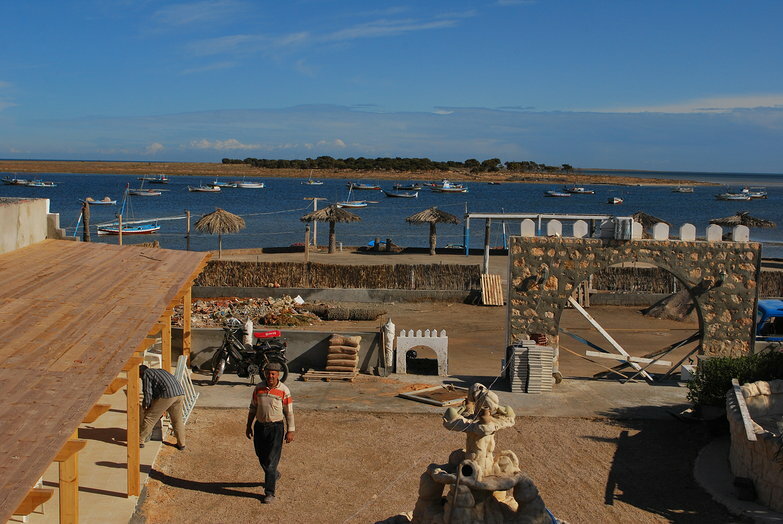 He owns a cafe right by the port, is very friendly, and will charge you a fair price for your excursion." The next day after some morning drizzle, the skies cleared up and the sun shone brightly again. Hoping to make the most of another beautiful island day, we decided to ride over to El Attaia and search out the local legend. After a short ride made easy by strong tailwinds, we arrived in the village and rolled up to the first cafe we found. It was filled with the usual crowd of men smoking chicha and drinking mint tea. One young man stood outside in front of the steps, and so I went up to him, asking tentatively if he knew Sta Ali. The man grinned broadly and shook our hands, welcoming us to the island. He then responded to my question with a laugh, saying, "of course I do! I'm heading over to see him right now, follow me!" I guess Madame Ferhi was right! The man grabbed his rusty bicycle, joking at how different his was from ours, and Tyler and I trailed behind him. On the way, he told us about his life on the islands in near-perfect french. 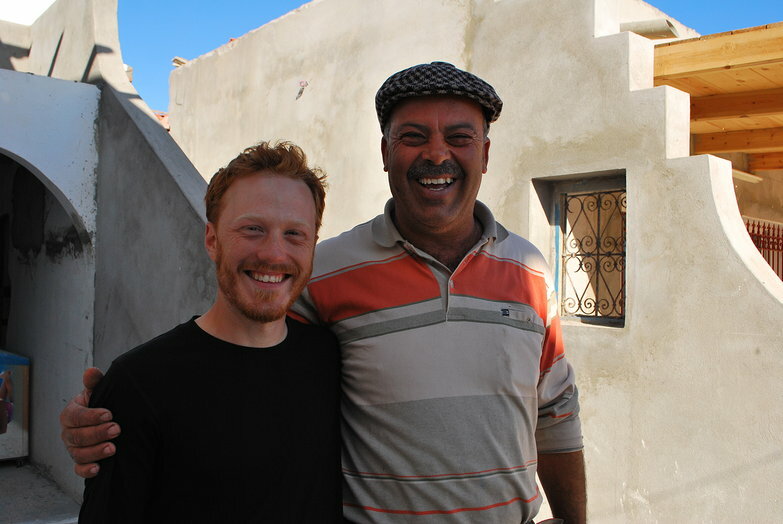 He grew up in this village, left to go to college in Sfax, and then returned here to be a fisherman. He said he could use his degree to work for a professional soccer team but he gets paid much more to fish. After cycling on rough dirt roads past houses, chickens, and smiling children, we arrived at a surprisingly modern cafe right by the port. Our new friend introduced us to the owner, Sta Ali, who encouraged us to go sit up on the terrace, enjoy the sea views, and sip some freshly-brewed Turkish coffee. We eagerly accepted and the young man led us upstairs where we hung out for a little while to chat. When we asked him about fishing, he told us that Ali is currently very busy renovating his cafe so he would not be able to take us anywhere. He also explained that no one was out fishing today because of the weather. He pointed to several colorful boats, moored in the harbor, and said that on a good day, the docks would be empty. Looking out at the clear blue sky and brilliant sun, it was hard to imagine how this could be considered "bad" weather, but our friend explained that the wind was the problem. With no fishing excursion on the horizon, we finished up our coffees, thanked our kind "tour guide", and proceeded to battle ridiculously strong headwinds all the way to Remla. No wonder the winds were such a problem. We could barely manage 10kph on the totally flat roads. It was like riding through molasses! With much struggling we made it back to Remla and bought lunch at the local pizzeria. The men working there recognized us instantly and gave us a warm welcome. When we were done eating our delicious sandwich and pizza, we made our way across the street to the coffee shop that has free wi-fi. We're becoming fixtures there as well, the length of our daily stay spanning several friendly waiters' shifts. Everyone is so nice here, and it feels good to settle in a little bit. Tyler is buried in work right now and we may have yet another problem with our wheels. We just might have to make these lovely little islands our home for the next week or so. I told you to find a good place and stay awhile...well done! It sounds amazing! Sending loads of love!